Stampbord is a stamping surface that is ideally suited for just about any medium that you can think of applying on it. The ultra smooth white clay finish can accept all traditional arts and crafts inks. For us in the stamping world, dye based and pigment inks are a snap. The dense absorbency of the surface allows for color application without runs. Your stamped imagery will look crisp and clean. The Stampbord coating is a smooth absorbent clay ground comparable to the clay gesso grounds used during the Renaissance. It is archival, lightfast, and acid free. Layering a lot of media in such applications as collage? No problem. With the stiff backing, Stampbord will never buckle no matter how saturated the surface becomes. We've even had it under the sink and, when dried, the surface was perfect and unblemished. When I'm trying to explain this panel to someone that hasn't seen it before, I describe the thickness as something akin to a standard brown clipboard only this material is a museum quality panel. 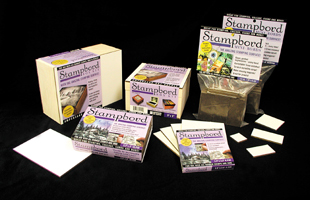 Stampbord has been available in the art world for years now under the name of Claybord. Professional artists have been using it for acrylics, gouache, tempera, egg tempera, pen and inks as well as for mixed media techniques, airbrush, and collage. Ampersand has now made this material to be applicable for our methods in the stamping world by manufacturing this amazing surface in smaller sizes. Sizes that would be perfect for things such as card, pin, magnet, stamped jewelry making, etc. For larger sizes you can purchase Claybord from your art supply source. Going back to the white clay surface of Stampbord, one of the greatest aspects of these boards is that we can scratch back into them with great effect. Now our stamp surface is both additive and subtractive. What does this mean? It means that for the first time in stamping, we can use a variety of tools to remove, subdue, or accent our stamped work with textured accents. See the tools section for examples of this point. Don't be afraid of this material. It's so forgiving that if you don't like what you've stamped, you can even "erase" it off your boards! How? By using steel wool or sandpaper to buff it out. How many surfaces can claim that ability? Stampbord is quite possibly the most beautiful stamping surface. ~Kevin N.